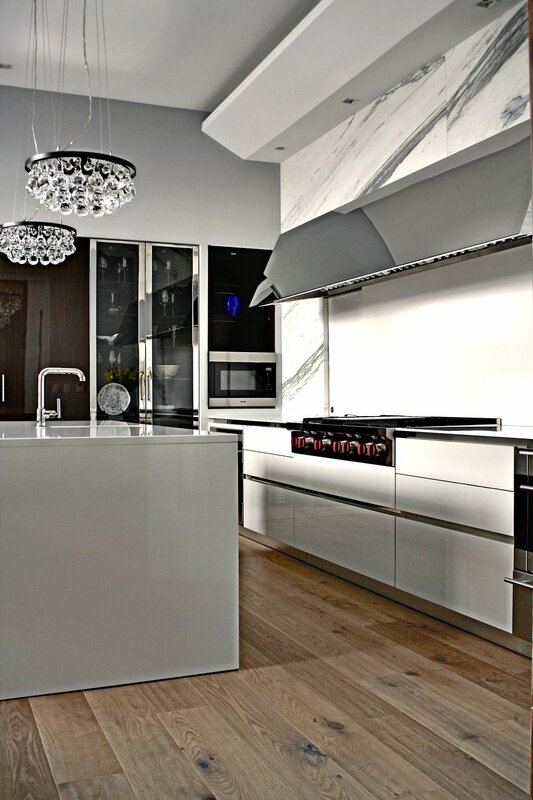 "Great design is true collaboration of the client and designer." 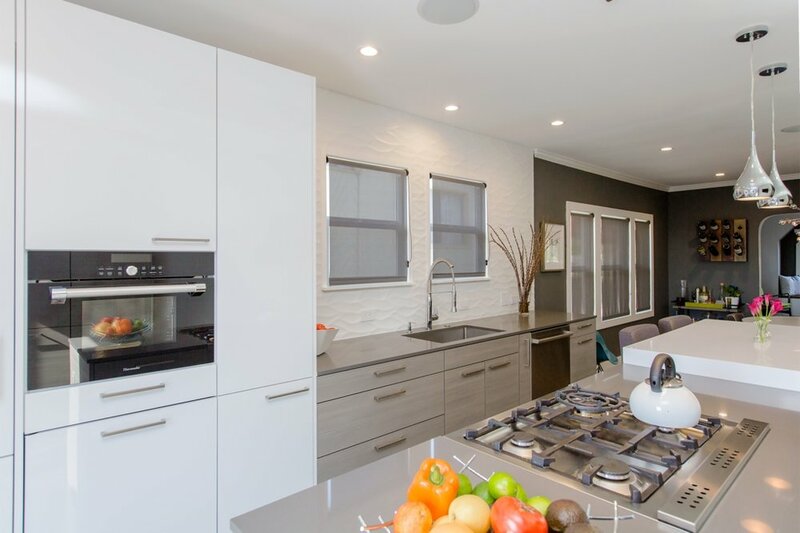 William Adams Design aims to improve the environment in which you live, work and stay. 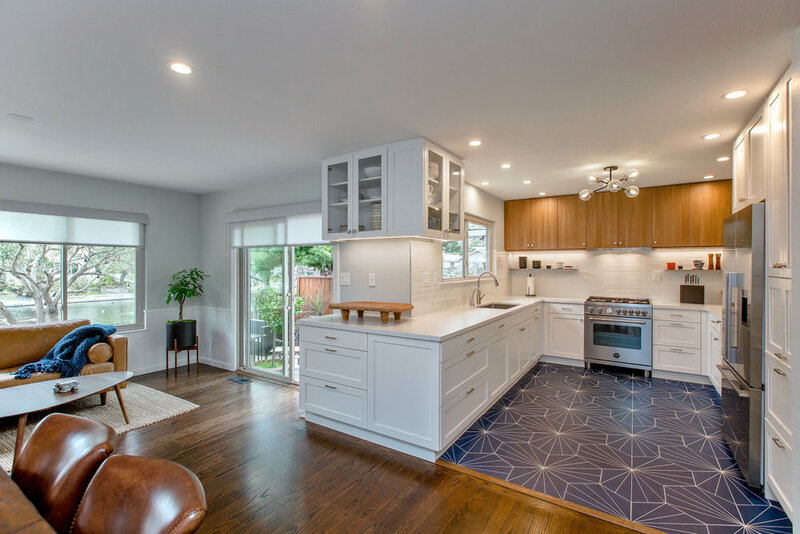 Resting on a quiet lagoon, this Mid-Century single level home in a tranquil cul-de-sac had not been remodeled much since its inception in 1963. 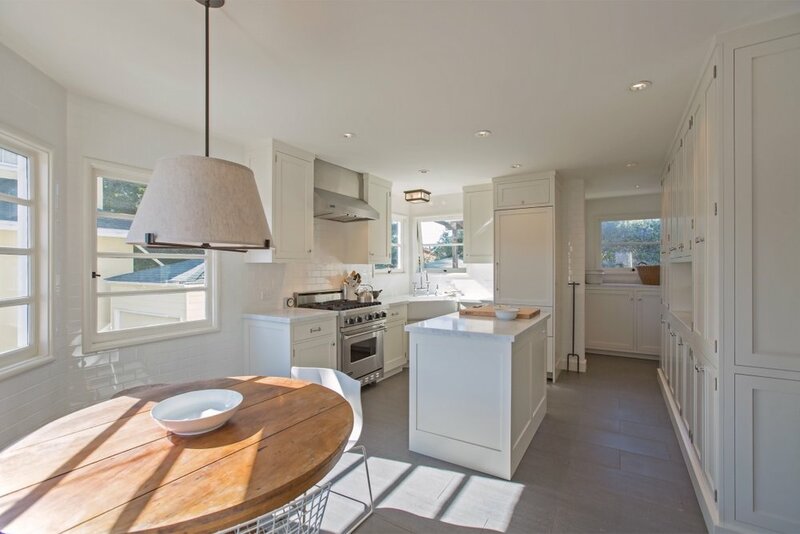 A ranch-style home, fit for entertaining with its oversized windows and waterfront views, it was calling for some color, warmth & brightness. 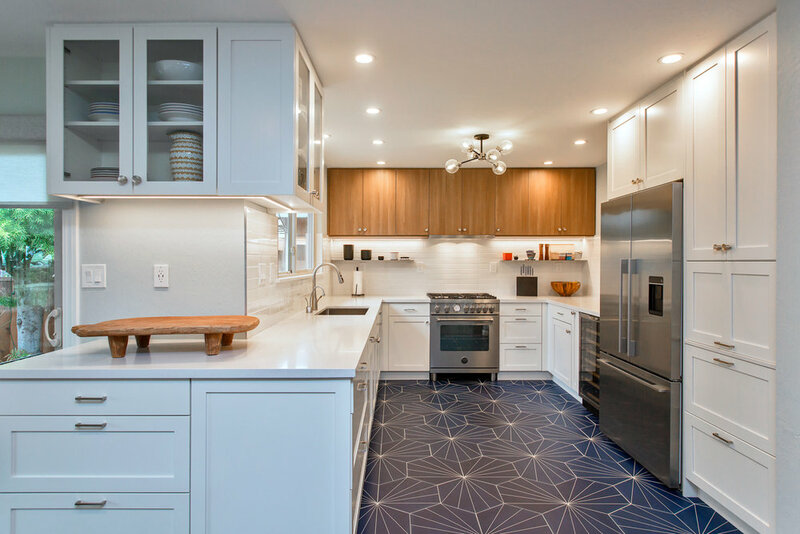 With traditional semi-custom shaker style white cabinetry in the kitchen, the fun patterned floor brings a playfulness to what would otherwise be a sterile space. 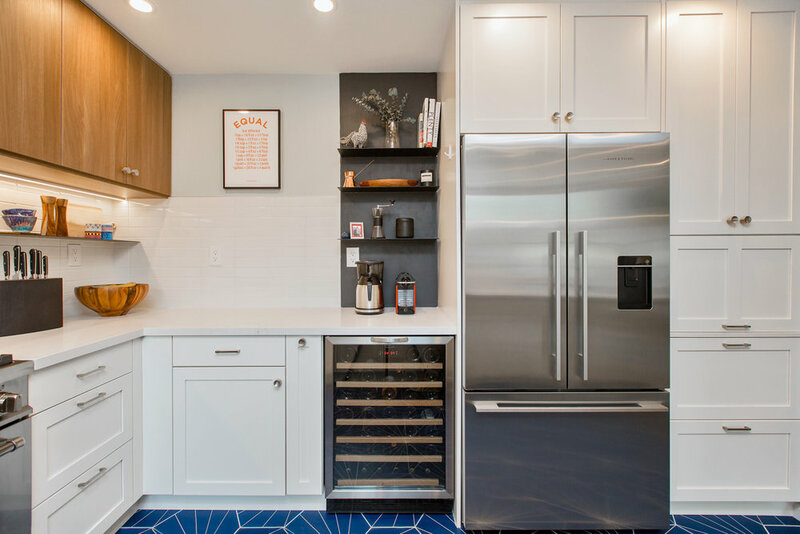 The hidden magnetic chalkboard continues the added fun for the adults, where one can open a bottle of wine or display their children’s artwork. 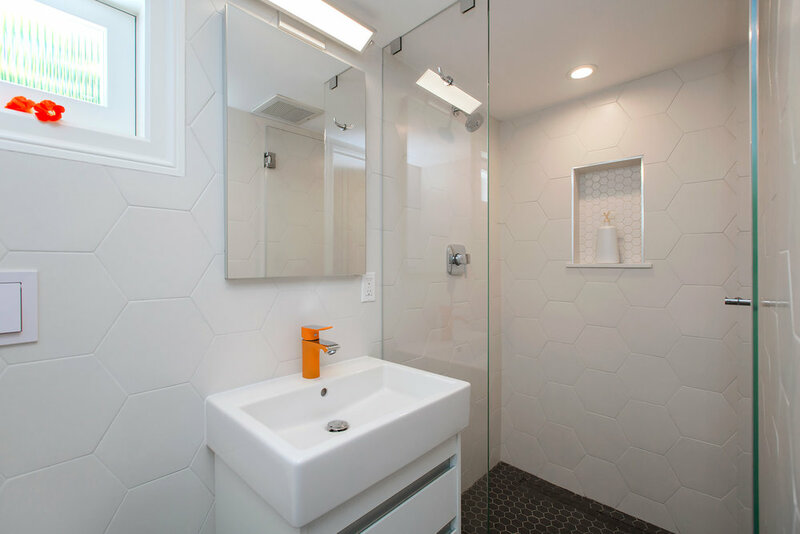 The Master Bathroom has beautiful handmade ceramic stacked subway tile mixed with porcelain marble patterned tile. 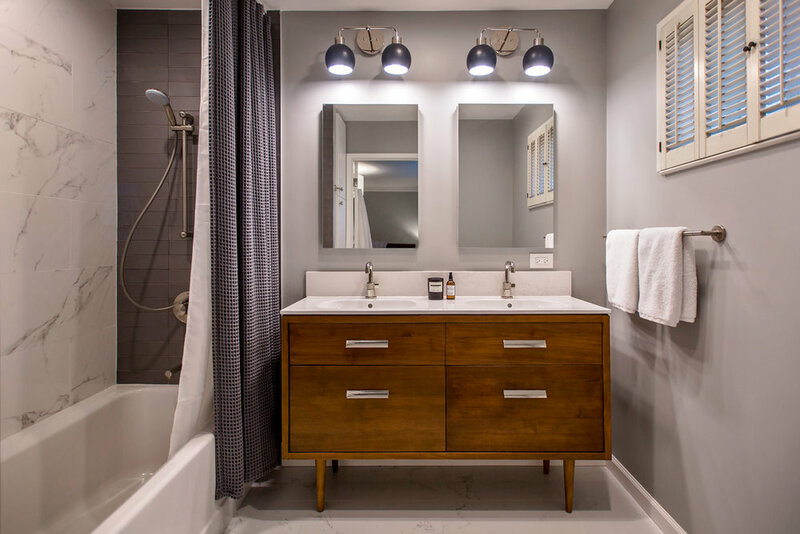 The teak double-vanity brings a great deal of warmth to this peaceful retreat. 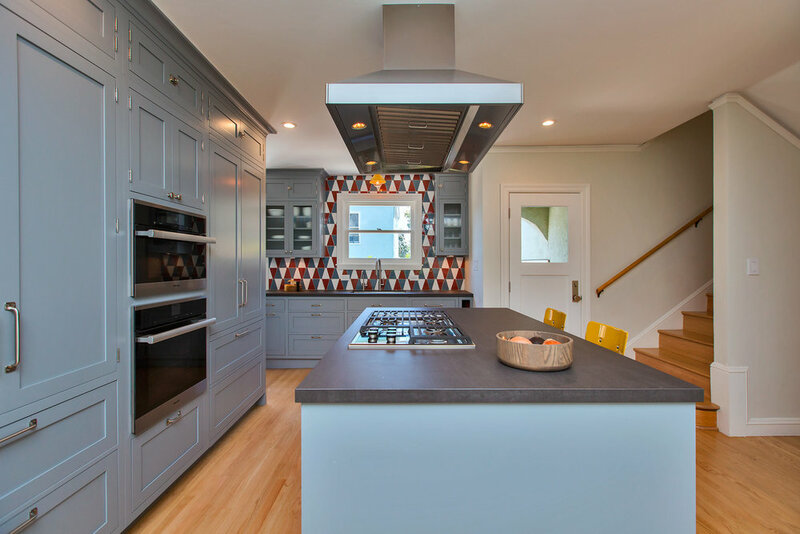 Though typically a very traditional and dark styled home, using colorful and modern elements brings a refreshing twist to this single family residence in Alameda, California. 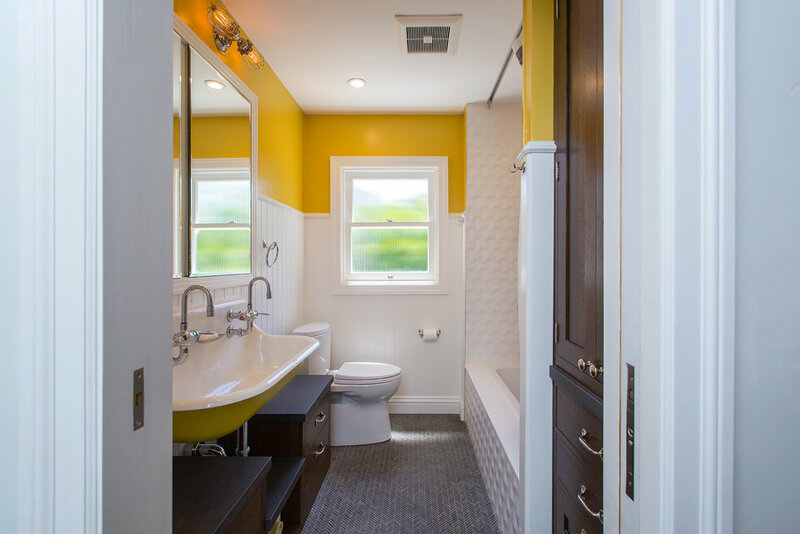 Soft blue-greys, pops of yellow and a nod to Spanish heritage with terra-cotta faux porcelain tiles really makes this space a unique one. 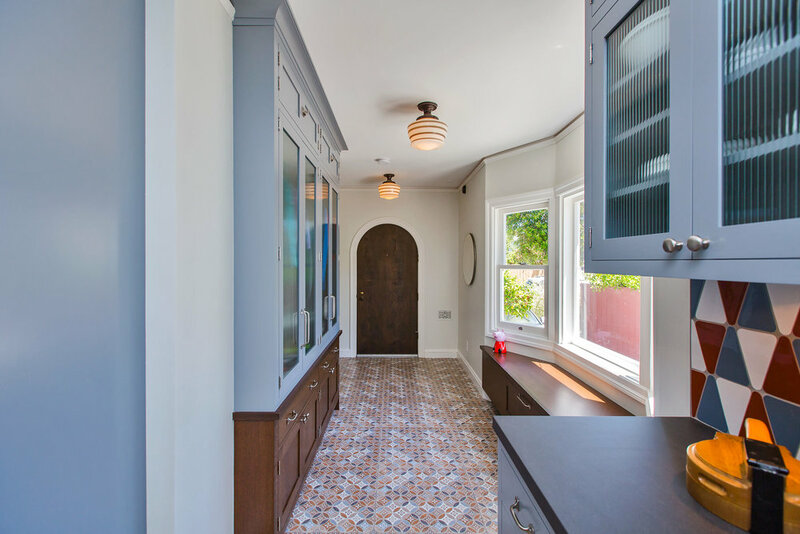 The patterned floor in the entryway is welcoming to guests and family members, giving them a place to sit, drop their bags & coats into beautiful oak cabinetry with reeded glass doors and grey accents. 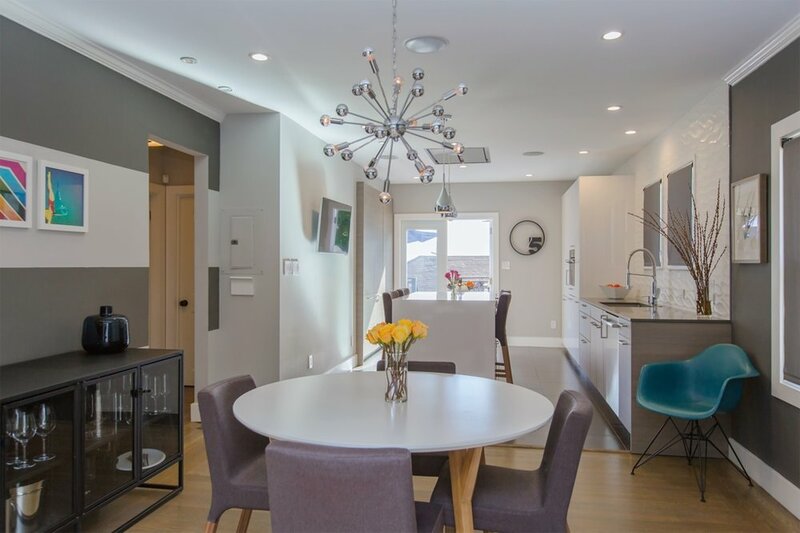 Limiting the recessed lighting and installing more surface mounted lights is more aligned with the true architecture of this home. 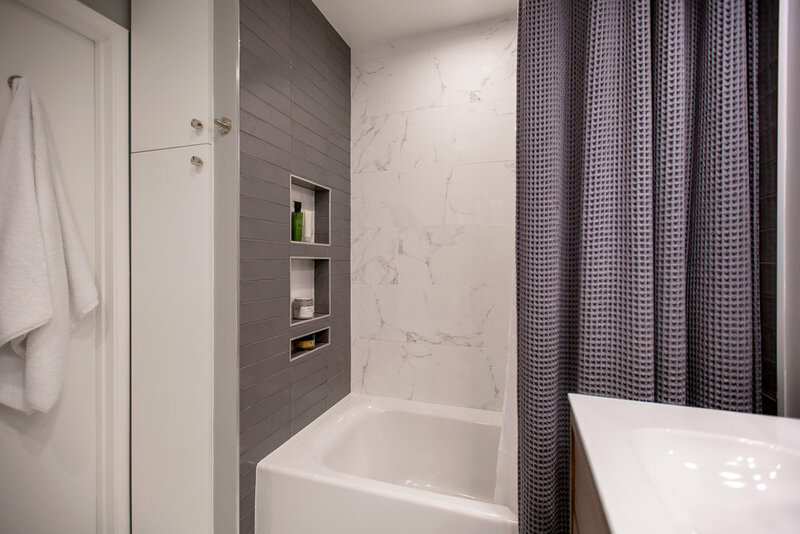 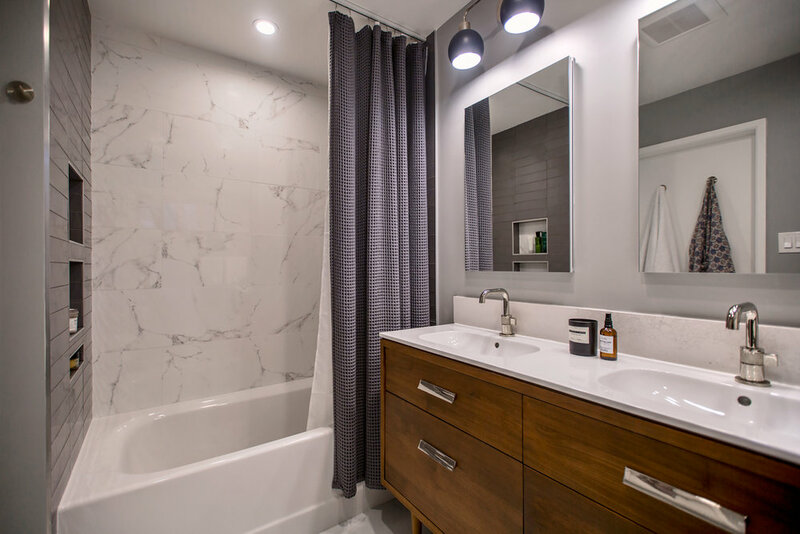 The main bathroom has a fun and functional trough styled sink, medicine cabinets for storage, and a beautiful custom quarter-sawn oak apothecary cabinet for everyday storage. 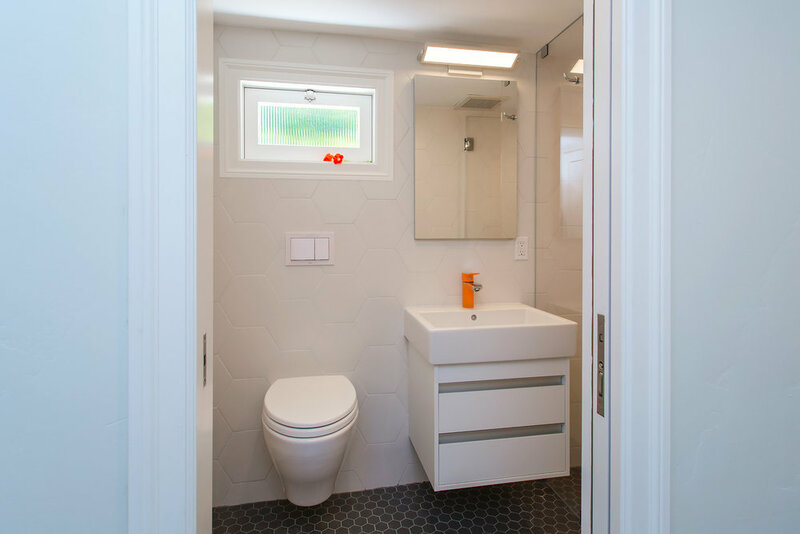 Downstairs, the guest bathroom is an unexpected modern surprise of white hexagon tile, a floating vanity & timeless design. 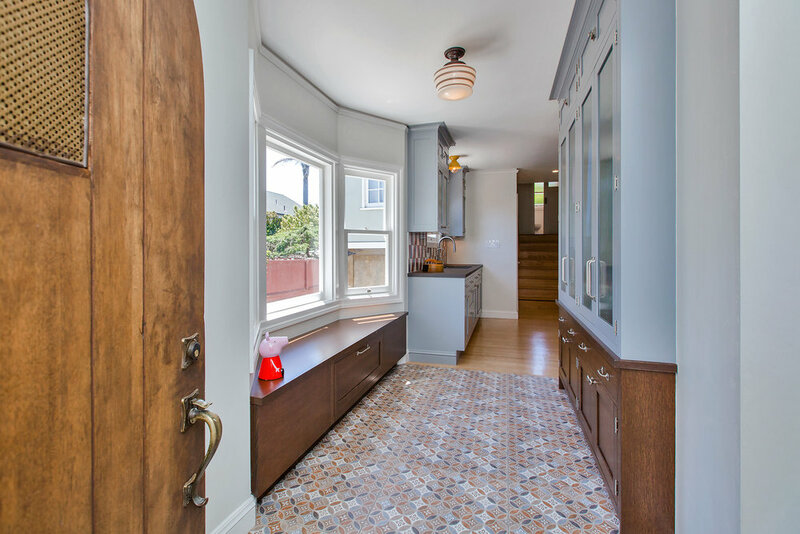 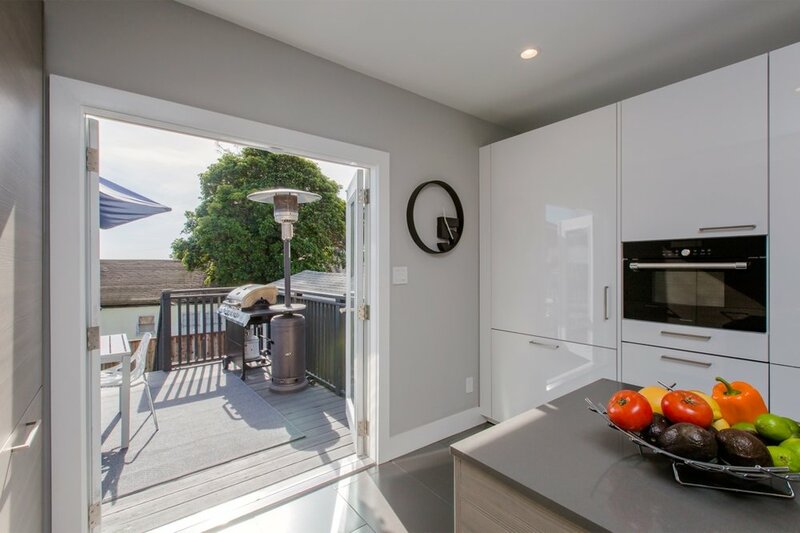 Reviving this 1923 bungalow home nestled in the Pineapple Belt of Oakland, California was done so by pushing the envelope on mid-century modern styling and meshing it with European clean design. 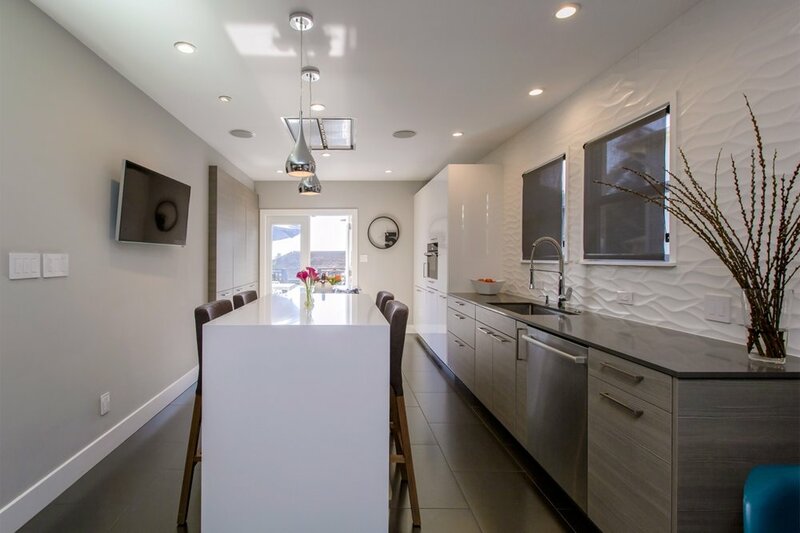 Opening the dining room and kitchen as one shared space increased the overall footprint and functionality of the spaces, great for entertaining and cooking. 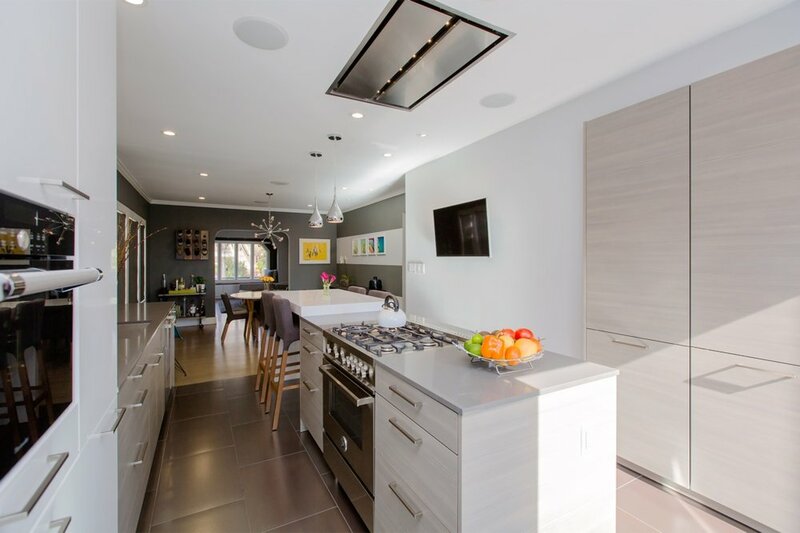 The galley shaped kitchen with the elongated island allows those preparing meals to entertain their guests, without interruption. 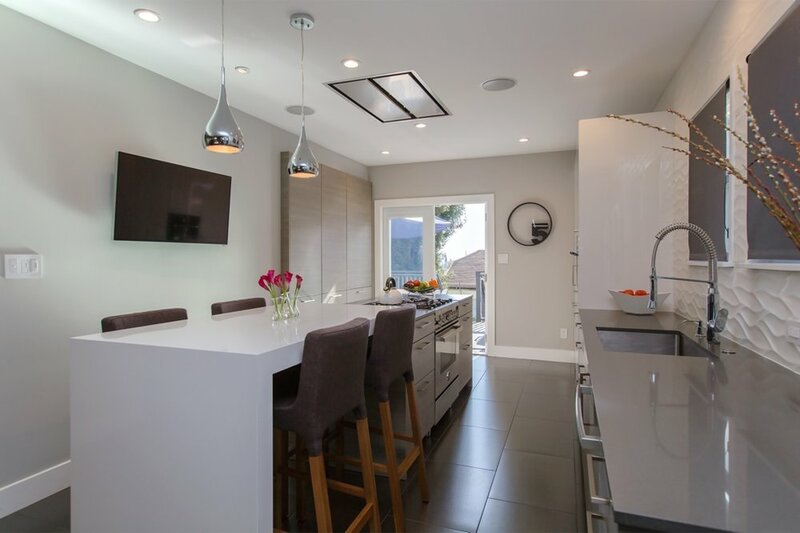 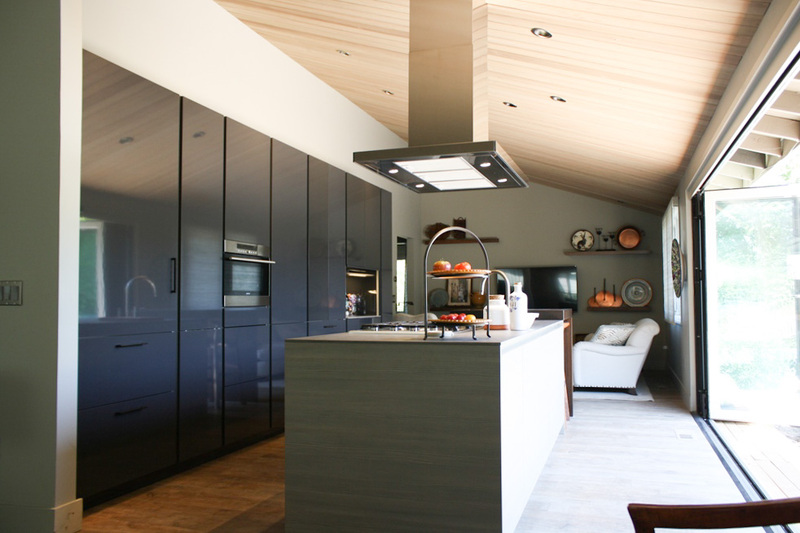 An in-ceiling mounted hood allows the view to the backyard and the California Hillside to be fully unobstructed. 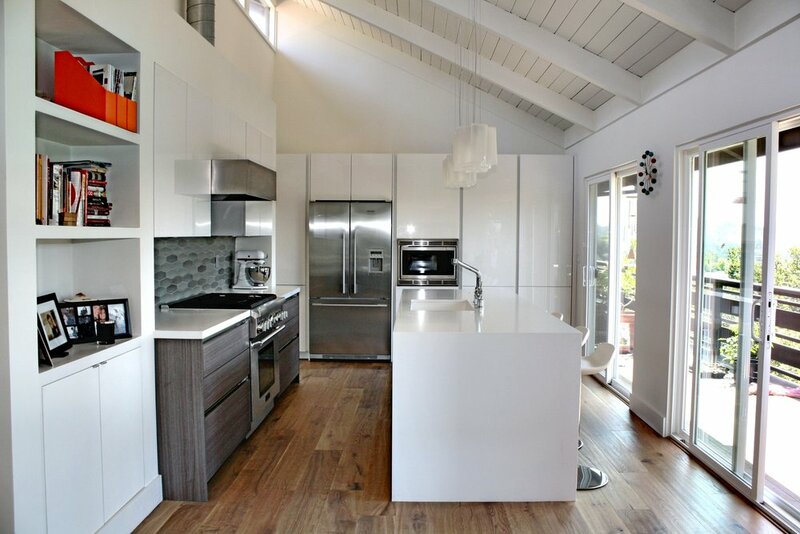 White gloss lacquer accents combined with warm wood elements create a welcoming space for everyone. 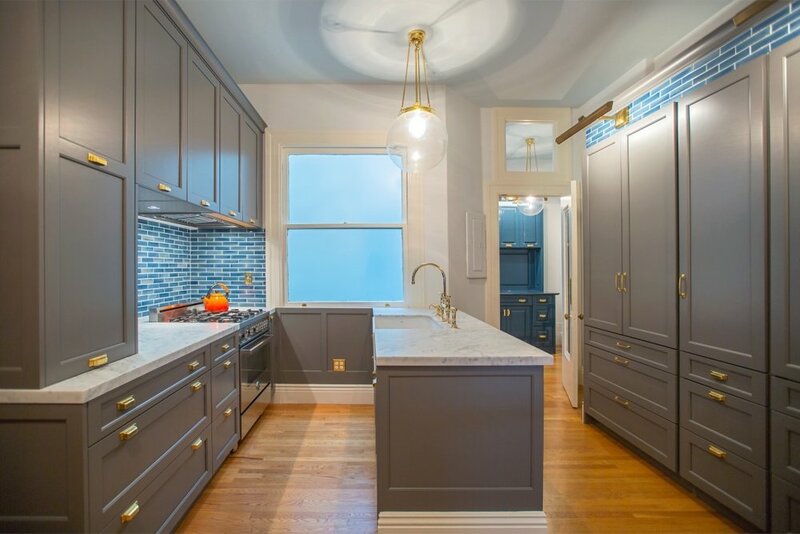 Originally constructed in 1902, the owners of this condominium wanted to persevere the originality of the Edwardian style home in Pacific Heights, San Francisco. 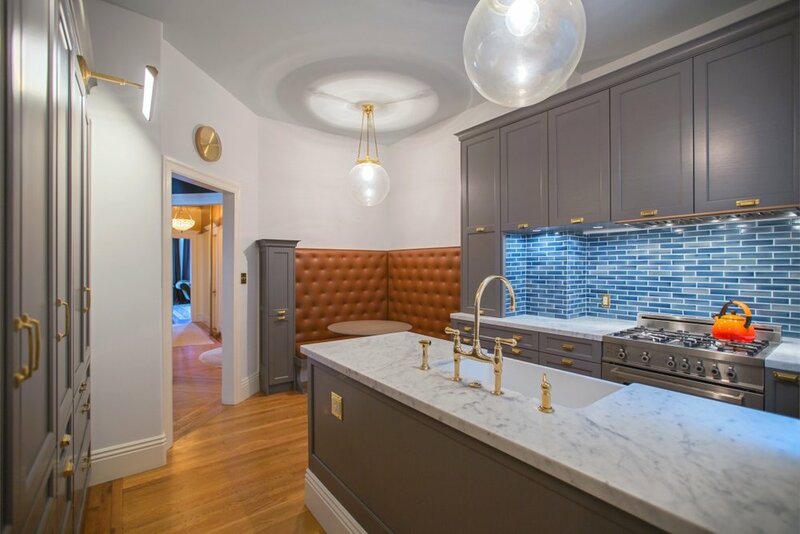 That meant having only pendant lighting, task lighting that was true to the style, yet energy efficient, and unlacquered brass hardware, that would naturally tarnish over time. 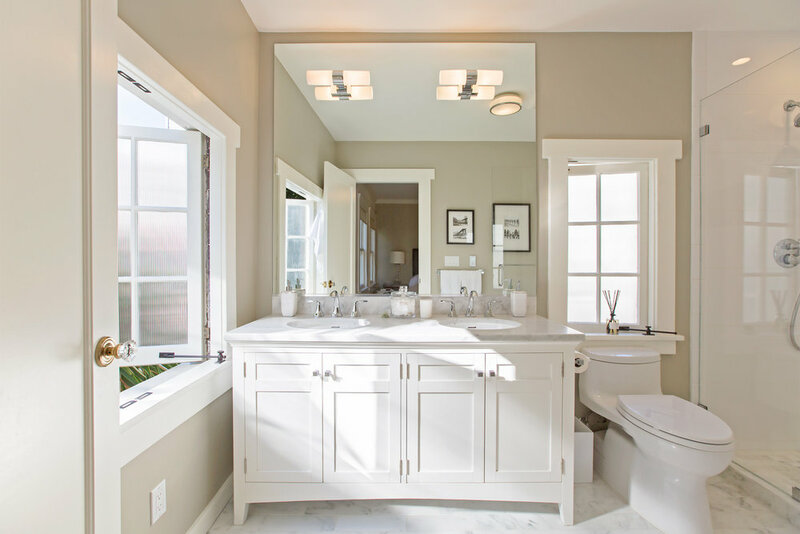 Beautiful Carrara marble wraps the fireclay farmhouse sink with warm grey painted cabinetry. 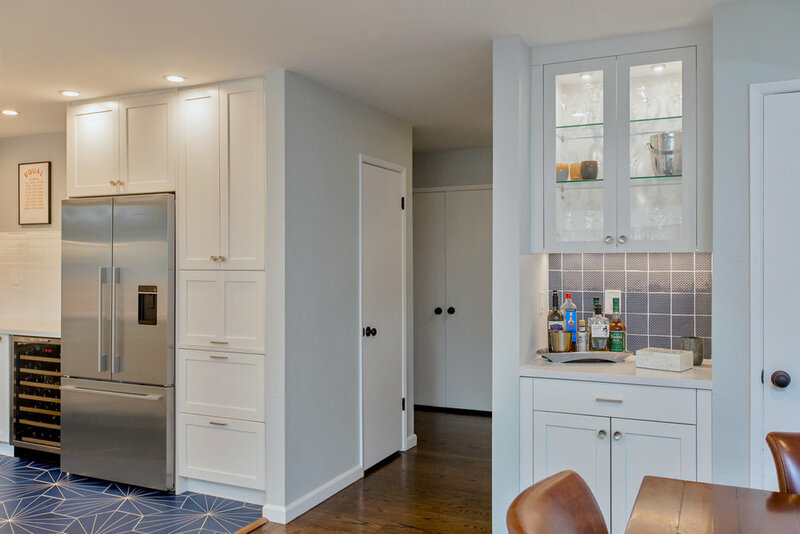 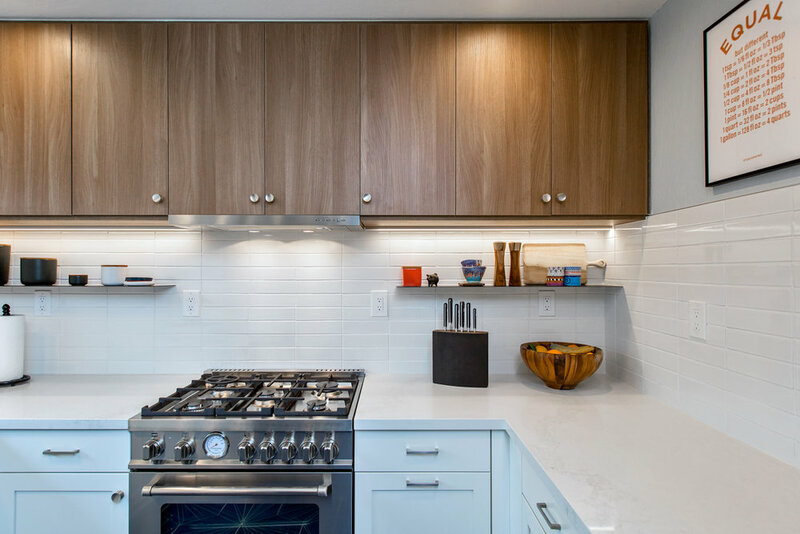 The refrigerator takes on the true form of an ice box by being concealed behind cabinetry paneling. 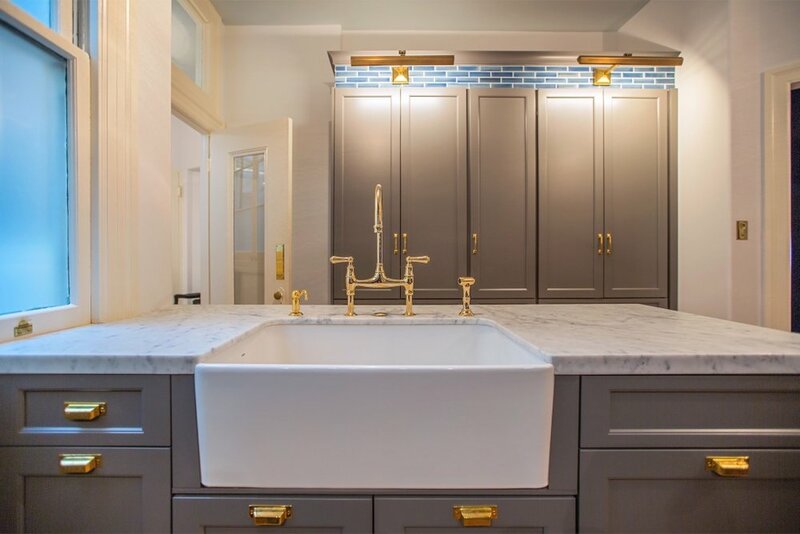 And the handmade blue tile is a reflection of what was once part of this home, similar to the original tiles in the dining room. 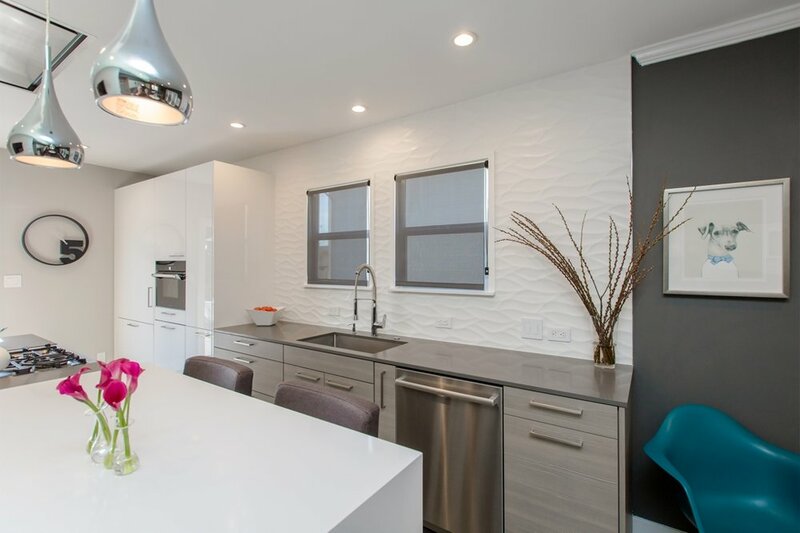 A watering hole of sorts is located at the base of the tall wall, allowing the resident dog to have a place to hydrate & eat. 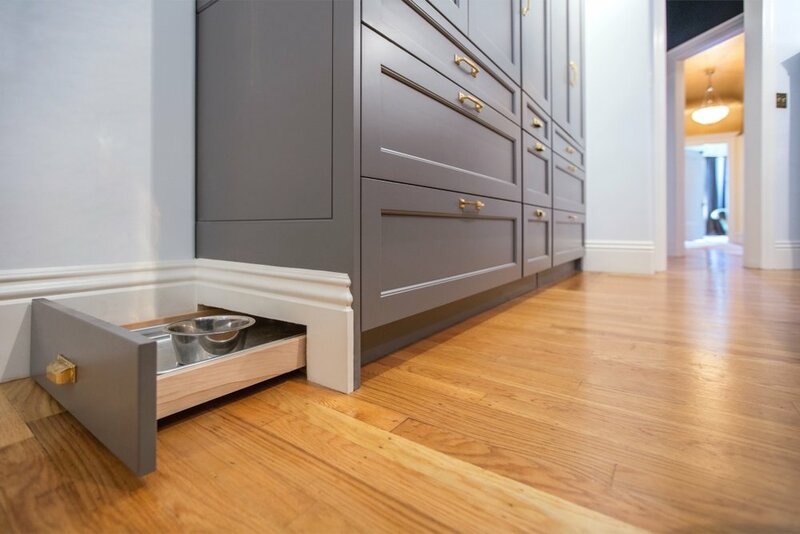 The Butler's Pantry has become not only a serving place but also a hidden desk, with a pop-up computer monitor and roll-out keyboard. 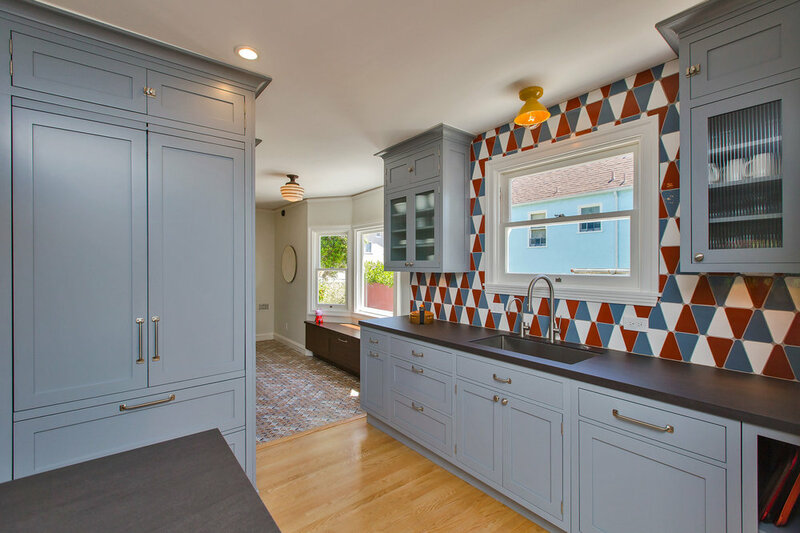 And the dining room sings with warm welcomes of its orange walls & aqua tile.